We are an independent, conservative evangelical and Protestant church, standing upon truth of the Bible, which is the very word of God. We exist to proclaim the gospel of Jesus Christ crucified for sinners. We uphold the complete inerrancy and historical accuracy of the Scriptures as being our sole authority in all matters of faith and practice. In pursuit of this high calling of preaching Christ, the only Saviour of men, PFMC shuns the political correctness which has become the message of so many churches in our day. The task of churches is not to mimic the fashionable doctrines of secular liberalism (Romans 12:2, Colossians 2:8), but to be separate from the world and to proclaim the truths of God’s word, regardless of whether the world likes it or not. Modern Britain is simply not hearing about the need for each individual to repent, nor about the reality of God’s judgement upon sin. Instead, the message generally passed on by the mainstream churches is the old, social-gospel heresy, which bears little difference to atheistic Marxism. Our nation needs, not clichés about ‘equality and diversity’, not a trendy, green ‘save the planet’ focus, not the anaemic man-pleasing message of social improvement (which is actually no different to the what the politicians say), not the materialism of an ‘abolish poverty’ emphasis, but a straightforward biblical call to repentance from sin and to faith in Christ for salvation. 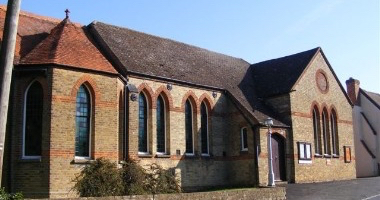 The church is situated on the B474 between Beaconsfield and Hazlemere, near High Wycombe in Buckinghamshire.